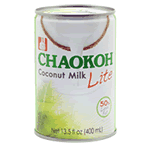 A low fat content coconut milk. For a delicious, rich flavor, add coconut milk to cakes, candies, cookies, curries and other dishes! Shelf life is 3 years at room temperature. Product of Thailand.